Our plan solidifies UMSL’s commitment to the five Missouri compacts for excellence in the 21st century: Student Success, Research and Creative Works, Community Engagement and Economic Development, Inclusive Excellence, and Planning, Operations and Stewardship. Our six core values are an integral part of each compact. Trust, inclusion, innovation, access, success and engagement each support and are strengthened by the specific goals we have set. While no plan can be fully exhaustive or anticipate perfectly what the future may hold, every effort has been made to ensure that our goals and actions are transparent and supported by relevant, comprehensive data that is ambitious yet realistic. We submit this plan with the ultimate goal of positioning UMSL for a future that is full of progress and continued excellence. These compacts are shared among the four universities of the UM System and provide unifying principles of collaboration across the system while recognizing each as unique and distinct universities. UMSL’s fundamental purpose is to educate and graduate diverse students as they seek different and better lives. UMSL has a responsibility to initiate and support innovative research, scholarship and creative works. UMSL is committed to maintaining a climate where all students, faculty, staff and visitors can explore their interests, refine their talents and flourish. UMSL is an essential partner in generating an educated work force, enhancing economic development, supporting broad-based service delivery. 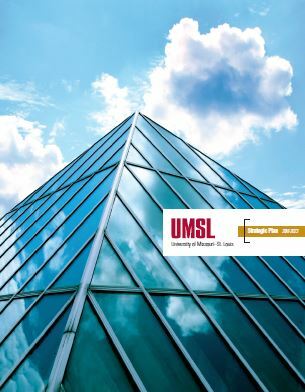 UMSL is a public asset that seeks to operate in a manner that supports optimal success in teaching, research, engagement and economic development. More than 72 percent of our over 100,000 alumni choose to live and work in the area post-graduation. We don’t just educate St. Louis; we are St. Louis, and our influence begins in our own backyard. Unified public education for the greater good: The University of Missouri System exists to deliver excellence in teaching, research and creative works, economic development, engagement and inclusion. Formed in 1963, the UM System consists of system administration and four universities: the University of Missouri–Columbia, the University of Missouri–Kansas City, the Missouri University of Science and Technology and the University of Missouri–St. Louis. Each university’s component parts, including but not limited to MU Health, MU Extension and UM Engagement, are an integral part of the system as well. The UM System is organized to achieve more collectively than any component part could achieve individually. This principle guides decision makers in managing affairs, whether they be in academic, research or business operations. It is the fundamental responsibility of each UM System university and its leaders to effectively manage resources to achieve the vision and mission of the UM System. Such a responsibility compels everyone involved to look beyond individual universities and interests and to enable the UM System as a whole to meet the needs of the people of Missouri, the nation and the world.